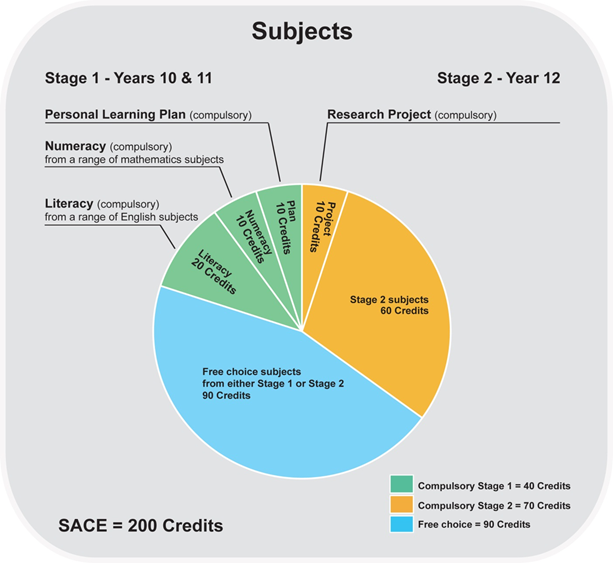 The curriculum of students in Year 11 and Year 12 is underpinned by the SACE. The SACE prepares young people for work, life and learning in a changing world by building essential skills, knowledge and understanding that supports them in achieving their life and career goals. The SACE provides considerable flexibility for young people and helps them to build on their learning throughout their school life as well as preparing them for life beyond secondary school - whatever path they may choose to take. The SACE comprises two stages or year levels. Each subject or course successfully completed earns ‘credits’ towards the SACE, with a minimum of 200 credit points required for students to gain the certificate. Students will receive a grade, from A to E, for each subject. For compulsory subjects, students much achieve a C grade or better. As a general guide, 10 credits usually equates to a semester subject. Completion of at least 60 additional credits in Stage 2 subjects and courses. In addition to the compulsory elements, students will choose from a wide range of subjects and courses to earn the remaining 90 credits to gain the SACE. These include subjects and courses from either Stage 1 or Stage 2. These remaining subjects are flexible and should be chosen based on a student’s interests, skill and career pathway. The diagram opposite illustrates the SACE pattern.